The original band lineup slowly came together during the late ’80s and early ’90s, with founding members Neil Jendon and Jerome Brown providing the band with their name (for reasons unknown; even to them). Along with a drum machine, they were joined by bassist Cliff Fox for their first release, the Sparkle/Charmed 7″ single, which was put out on the local Limited Potential label. With the addition of drummer Kerry Brown (no relation to Jerome) soon afterward, the drum machine was shelved. New guitarist Mark Rew also came aboard, and the group released the Billy Corgan-produced “Sleepy” EP in 1993. The EP was embraced in college markets, which prompted the group to sign with TVT for their debut album, “Sorry!”, later in the same year. Due to touring constraints, Fox left the band shortly after the release of Sorry! and was replaced by Keith Brown (Kerry’s brother). Catherine’s tour in support of the album found them opening for the likes of The Smashing Pumpkins, Hole, Suede, Dig, and Letters to Cleo. As a result of this widened exposure, Sorry! went on to become a largely appreciated college hit. In 1996, Neil Jendon and Jerome Brown both left the band, leaving Mark Rew and Kerry Brown as the primary singer/songwriter for the final Catherine release, “Hot Saki & Bedtime Stories“. Bass player Keith Brown also contributed, writing songs on the CD. While Mixing the CD in Chicago, the band met audio engineer Todd Tatnall, and later recruited Tatnall to play percussion and keyboard on tour. The band also recruited Scott “Fever” Evers (former bass player for the Urge Overkill) to play lead guitar on tour. Shortly after joining for tours, the band asked Tatnall and Evers to remain as full members. 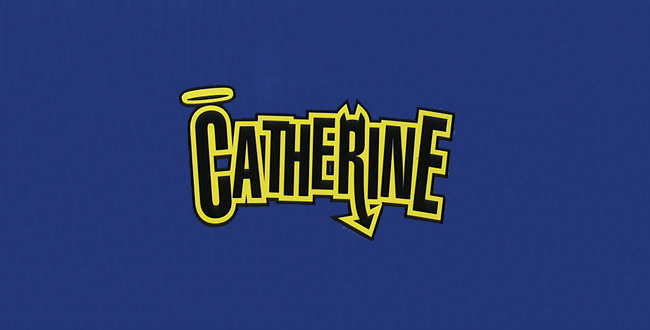 In 1997, Catherine toured the US and Europe, opening for bands like Garbage and the Lemonheads in the US, and playing several large festivals in Europe, including Reading (UK), Bizarre (Cologne), and Rocknacht (Leuven). After their 1997 tour, the band began recording a new LP in the studio they built in a remodeled barn outside Watervliet, Michigan. Meanwhile, TVT Records would not return the band’s phone calls. Opting out of their contract, Catherine was unable to secure a contract with another label. Although a total of 13 songs were written and recorded, none of the songs from those sessions were ever released, although at least one, “Flight 518″ was re-recorded in a later project by Rew. The original “My Friend the Snake” sessions have only been heard by a few friends and fans of the band. Discouraged by the lack of progress in securing a new contract, Evers and Tatnall left the band, followed by Keith Brown. Mark Rew recruited a few young musicians to continue playing, but eventually permanently dissolved the band. Rew and Jendon reconvened in 2007 and currently play a couple of the ‘lost’ Catherine songs in the Chicago-based band “Bugglette”, and independently released a new album, “Shame On You, Shanga Flowerdell” in late 2008. After a break from music, Jendon was a member of Zelienople for 3 years and appeared on several of their albums. In addition to playing with Bugglette, he is currently performing and recording electronic music under his own name. His first solo CD, “Invisibility”, was released on BloodLust! in late 2008.